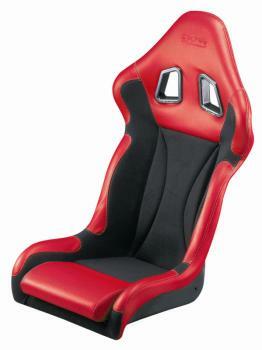 Sparco Tuner Seat - Roadster 2 - Dezod Motorsports Inc - Home of the automotive performance enthusiast since 2002. An evolution of the world famous competition seats, this seat is designed for highway use (not recommended for competition purposes) and designed for use in high performance sports cars. The special shape provides maximum lateral support and the bolsters still allow for ease of entry. The shell is constructed of fiberglass and is covered in high quality Jacquard material assuring a long life as well as good looks. A high-tension spring and wire system have been used to secure the cover of the seat to the shell. This cover can be removed by unfastening the spring located under the seat shell. This system will allow you to easily clean the seat cover and restore it to a show quality condition. This feature will also allow you to replace your seat cover after many years of use giving you a brand new seat without having to purchase the entire shell.